There are many reasons to switch from commercial, store-bought products to natural teeth whiteners. Aside from the fact that store-bought products contain ingredients that are harmful to your oral health, natural teeth whiteners will provide a more effective cleaning for your teeth. This recipe uses turmeric powder, a spice that has proven to provide many benefits for oral health. 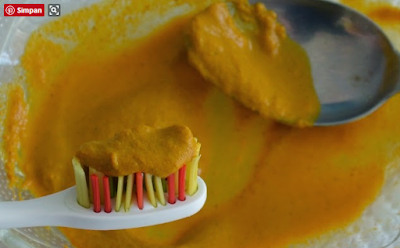 According to a study conducted by the Indian Society of Periodontology, turmeric was shown to be just as effective as a mouthwash when it came to oral health. Turmeric was shown to be incredibly effective at preventing plaque build-up and gingivitis and had noticeable anti-microbial and anti-inflammatory properties. Turmeric was also bio-compatible with all of the subjects who used it, meaning that they did not suffer from any side effects. Virgin coconut oil is also an important addition to this natural teeth whitener due to its antimicrobial properties. Various strains of bacteria have been shown to be inhibited by the medium-chain fatty acids that are derived from virgin coconut oil, making it the perfect supplement to put in oral hygiene products in order to prevent infections and gum disease. Note: To make in big amount, multiply the above quantity accordingly. Store your turmeric toothpaste in a jar with lid, in your bathroom. It can last for months. — Mix the ingredients until it forms a thick paste. — Apply the mixture to your toothbrush as you would with regular toothpaste. Brush teeth as normal. — Let the turmeric-toothpaste sit on your teeth for three to five minutes, allowing the whitening and anti-bacterial properties of the paste to really come into affect. Turmeric can often stain anything that it comes into contact with. However, it whitens teeth beautifully. Note though, that it doesn’t whiten dentures and cosmetic teeth! When done properly, you should notice your teeth beginning to whiten within the next few days. Now you have an all-natural teeth whitening toothpaste that has many benefits for your oral health.